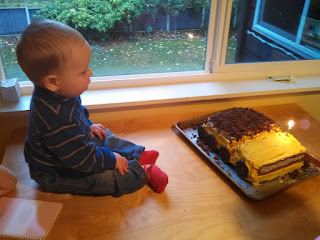 On November 19, we celebrated one year with B in our family. I can't believe it has been a year already! It seems like just yesterday that I was calling for a friend to pick up Jared and Eloise so that I could go have a very early baby boy. We started the big day with making cake. 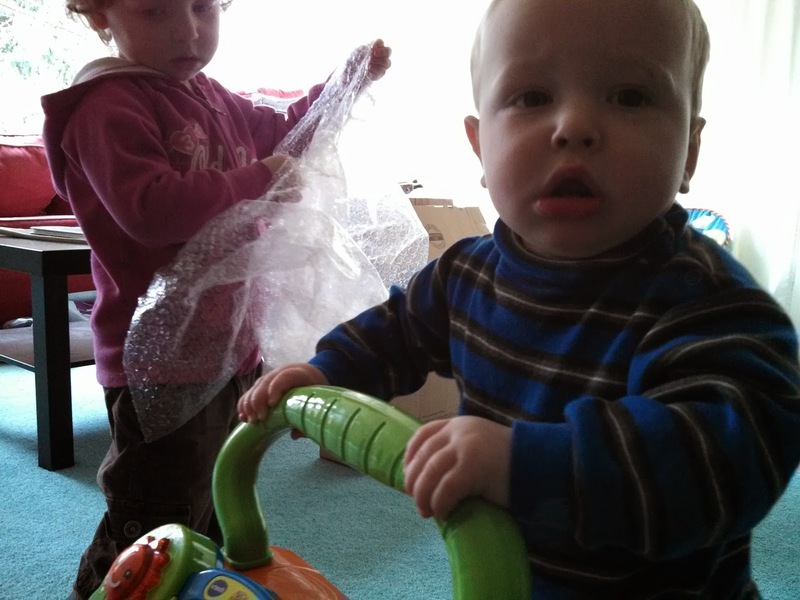 Jared and Eloise were having a rough morning, so we cheered them up with some present opening. B wanted to open his presents with his teeth. He makes better use of those two teeth than most of us make with twenty or more. 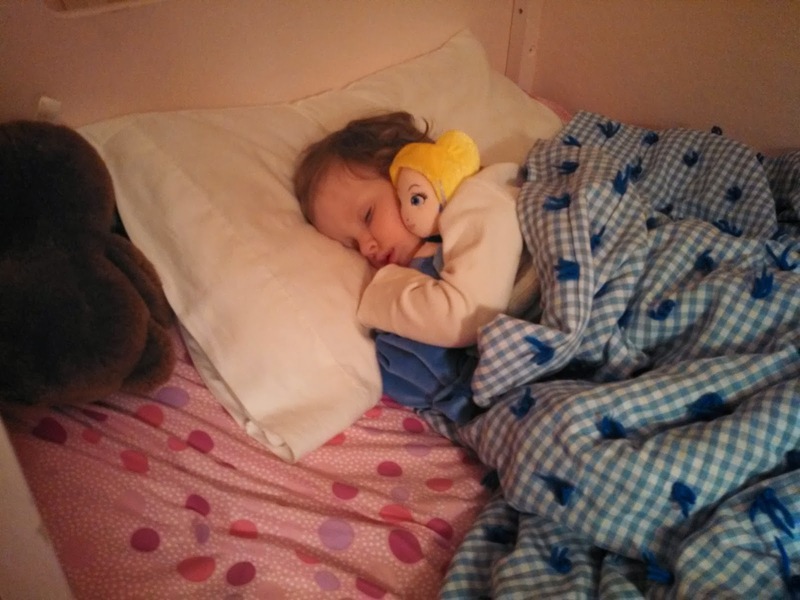 Jared and Eloise had each gotten B "something soft to cuddle." Jared got him a bear in a giraffe suit, which he named "Giraffely," and Eloise got him a stuffed frog. I saw this bead toy and could not resist it. 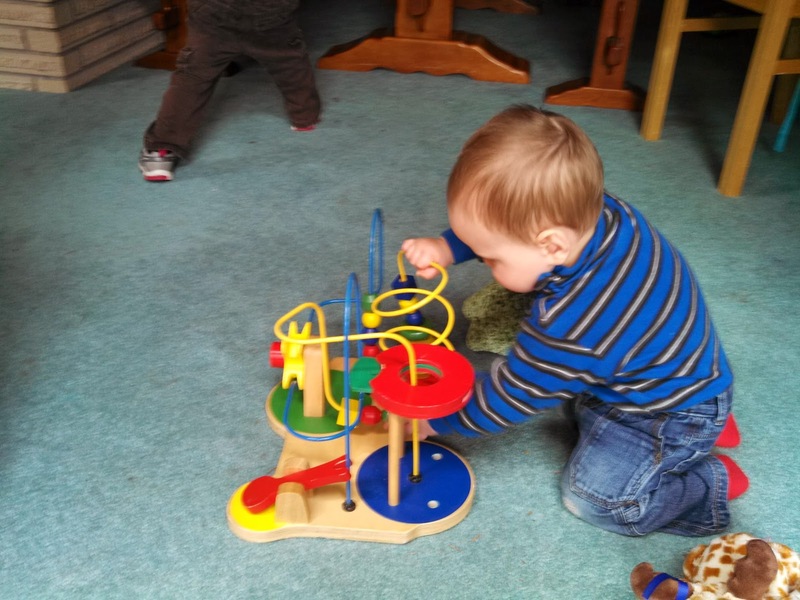 Think waiting room toy meets Rube Goldberg. The beads have traps and levers and springs for launching them. I want to spend hours playing with this thing. As an added bonus, the kids will learn physics while they play with it. Grandma and Grandpa sent a walker. As soon as it was put together, B got up and started pushing it around the house. Eloise really likes to play with it. She calls it her lawn mower. In the afternoon, we decorated the cake. 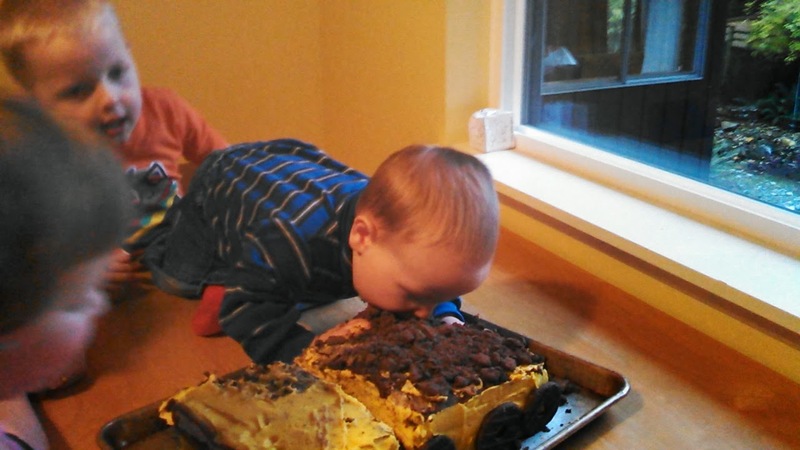 When I was deciding what kind of cake to make, the first thing I thought of that I know B likes is dirt. I was going to do a dirt cake, but, at the last minute, decided to make it into a dump truck. 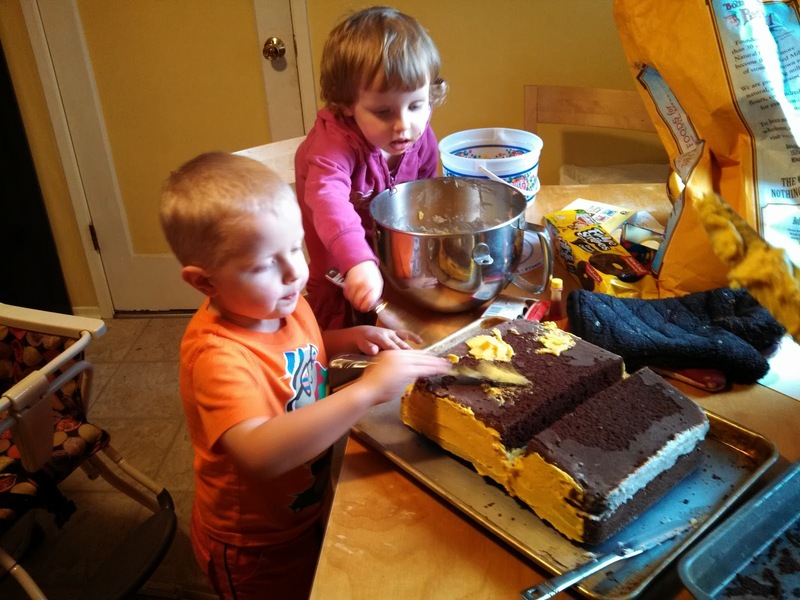 It turned out okay, with help from my baking team. Grandma and Grandpa Knight and our Georgia cousins tuned in for the big cake moment. B went straight for the "dirt," as expected. but B didn't need any help. 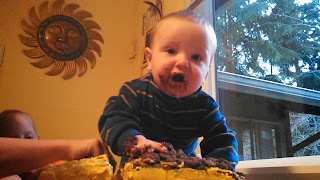 He got a big piece of cookie in his mouth and spent his whole time with the cake drooling chocolate all over. Most of the cake was a total loss due to drool. Eloise was delighted to point out that he was covered in chocolate. 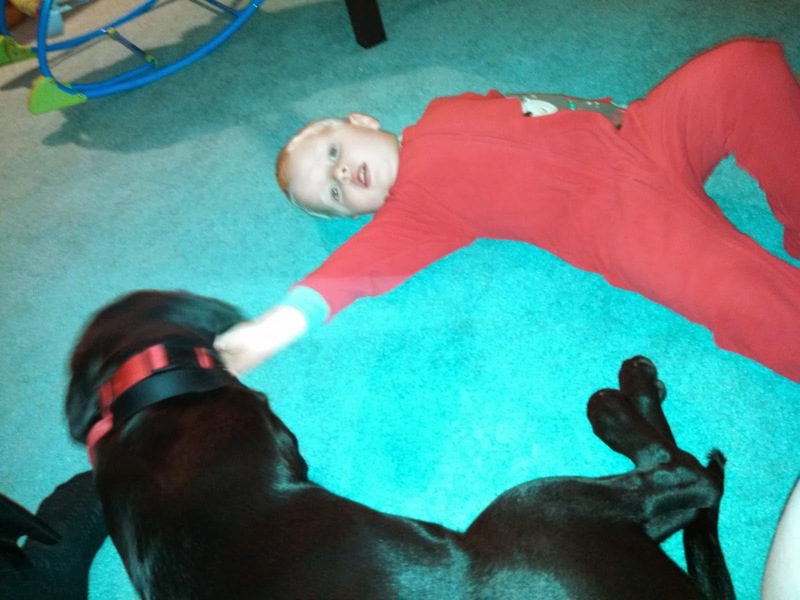 B loves eating dirt, trying to do anything Jared or Eloise is doing, and his dog, Shadow. He is very easy going, but is starting to be wary about unfamiliar people. At his 12 month checkup on Thursday, B weighed 22 lbs 2 oz., and was 29 inches tall. He is still hanging out in the 50th percentiles for both, as he has since birth. 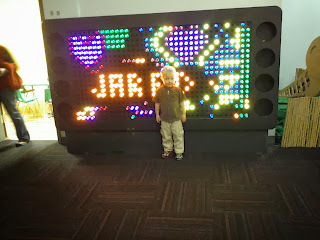 It is very exciting to watch him learn new things and say new words almost every day. 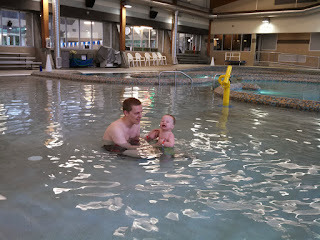 We have been planning for weeks to take advantage of Todd's last week of paternity leave to do a lot of fun activities. 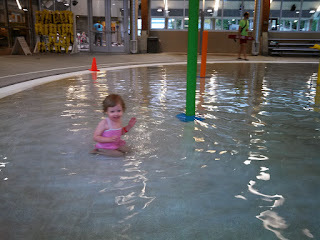 One that Eloise has been asking for since August is a trip to the swimming pool. 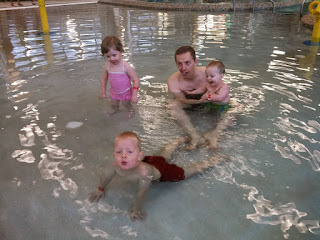 Coming to the pool by myself with three small kids is nerve wracking, so we decided to make good use of Daddy for this. 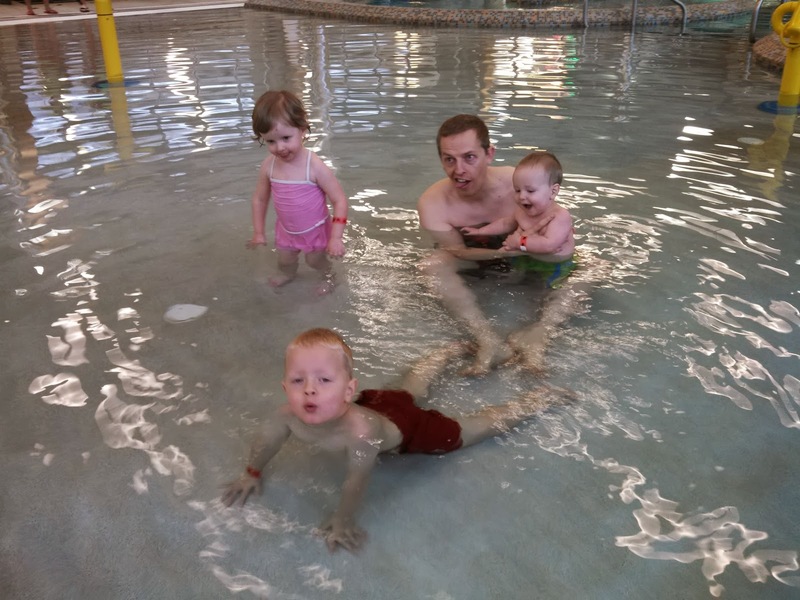 Jared and Eloise were so excited that they had their swimming suits on before breakfast. Eloise couldn't understand why she had to put anything else on in our 60 degree house, or to go outside in the 40 degree weather. 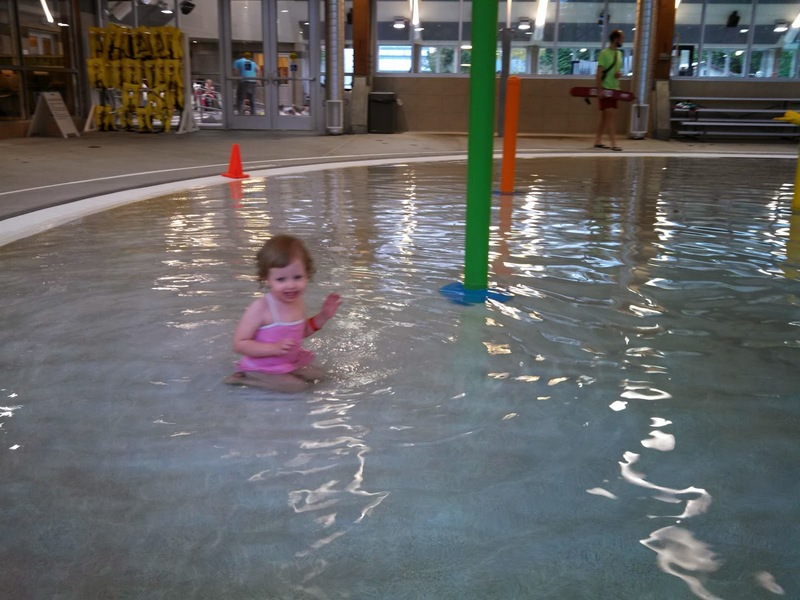 She remembered a lot of details about the pool for someone her age. She told me on the way to the pool that she was going to sit on a fountain. The fountains weren't on for a while after we got to the pool, but we had plenty of time to play in fountains before we went home. Did B like swimming? Why, yes he did. He added a new word to his vocabulary: splash! When he says it, it sounds like "Pah!" or "Pas!" but he always accompanies this word with some actions to make himself understood. Jared was wildly excited about being in the pool. 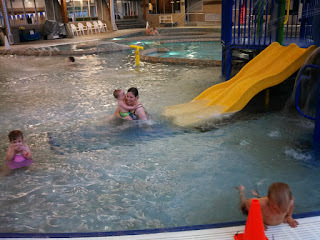 How do you tell a child not to run next to the pool when their feet reflect their utter exuberance? We are lucky that Jared was able to slow himself to a jog. I love Todd and B's faces in this picture. Does Jared like swimming? Definitely! This is his cheeseball face. We didn't have the pool completely to ourselves, but it certainly wasn't crowded at 10 a.m. on a Thursday. I wrenched my back a couple of weeks ago, thanks to a heavy baby going through a clingy phase, and it has gotten more and more painful with time, so swimming was a good activity for me. All of the resting and lying down time I have gotten with Todd home the past few days has also helped. I think it will be a while before I'm back to normal, but I feel a little better each day. Kids can only run at 200% of their normal energy for so long. Jared and Eloise both had locker room breakdowns out of sheer exhaustion. 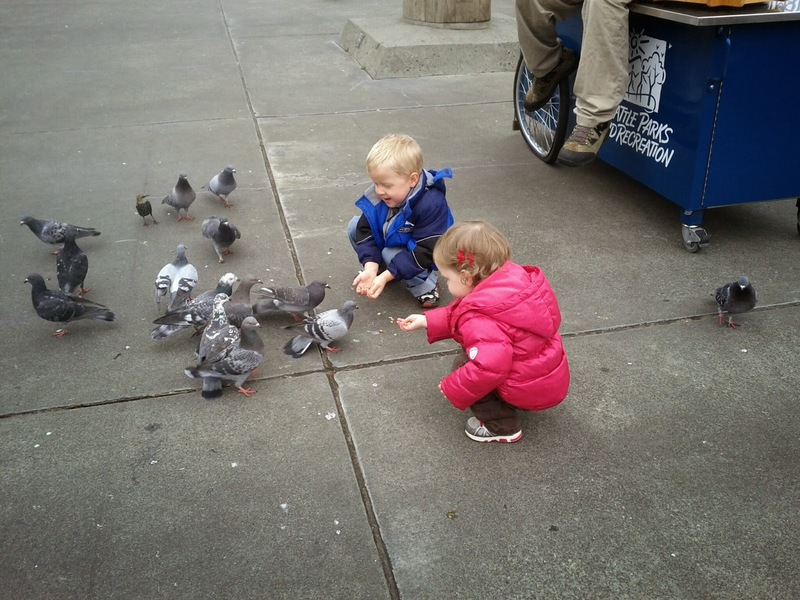 Jared HAD to have a snack RIGHT NOW, and nothing was going quite right for Eloise. Until I told her I wanted a picture. 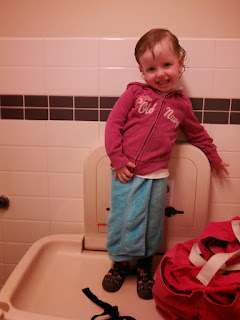 Note the towel wrapped around her waist "like Daddy!" 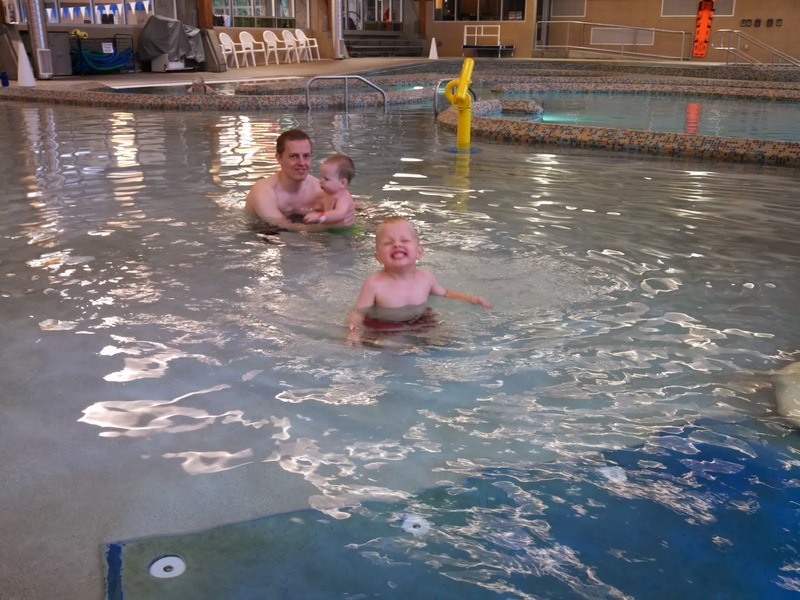 I wish we could have swimming outings more often. Next summer with all of its beach days cannot come soon enough for us. 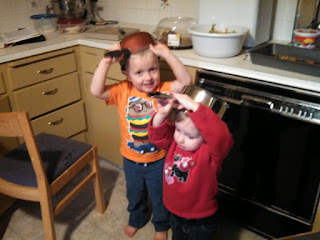 I live with some goofy little characters. Grandma Knight asked to see some new pictures of my little cheeseballs, so here they are as they look regularly on our morning walk. 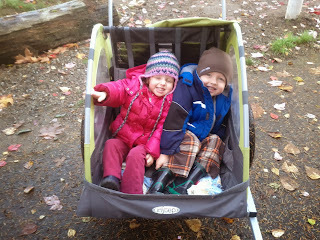 Their poofy coats make the fit in the stroller a little tight, but they are still smiling. Todd mentioned that he had watched an old home video of Jared around 18 months old putting a pot on his head, so Jared decided to reenact that cute moment from his babyhood. And what is good for Jared is good for Eloise, right? On Sunday, Jared was looking for some essential part of his clothing, and he couldn't find it. Ever dramatic, he informed me that it "Cannot be found anywhere." Me: Well, did you look downstairs? Jared: It mustn't be down there. Me: Oh, mustn't it? Did you look? On Monday, Eloise asked Jared if she could have something that he was finished with. Jared: You CAN have it, Eloise. Eloise: Do you mean I MAY have it? On Tuesday, Jared was helping clear the table after dinner. I gave him half a gallon of milk to return to the refrigerator. Jared: InDEED this is heavy! Me: Did you say, "Oh GEE this is heavy"? Jared: No. I said, "InDEED! Indeed! Indeed it is heavy." I don't know where they come up with this stuff. These are not the sort of conversations I would expect to be having with my four and two year old. Speaking of our two year old, here is a precious and rare moment of stillness from the princess. Jared now sleeps through the night most nights without needing a bathroom break, so he has returned to footie pajamas. They are so adorable on him that I am now regretting all of the cute time lost to two piece pjs. Let us not overlook the rest of the cheeseballs in this family. Here are the other two at the library today. 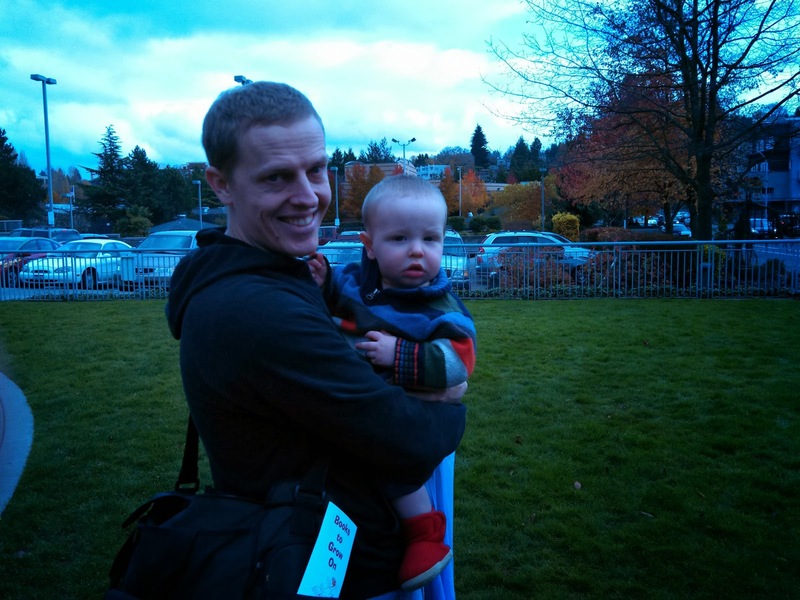 Todd has a final week of paternity leave to take this week before B turns one next week. 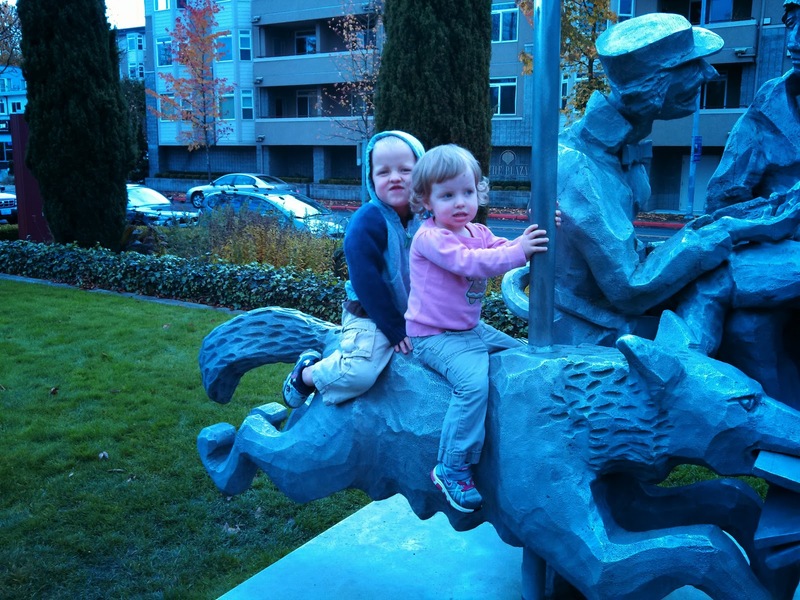 B was looking at Jared and Eloise sitting on a wolf statue making funny faces. B is getting more and more verbal. His word count is limited, but his communication skills are improving. 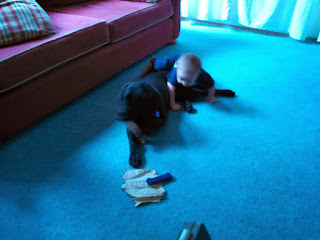 He has now said "Mama" and "Shadow" (Dah-oh!). He plays with Shadow a lot. I know Shadow is a good dog, because, in spite of her wilder moments, when B crawls on her, she lies perfectly still. If he inadvertently pinches or hurts her, she shifts out of his way without even giving him a look. This evening I prompted B to say "Shadow," and, for a few minutes I thought he wasn't listening to me. Then I realized that he was doing an almost perfect imitation of the growling, whining sound Shadow had just been making as she squirmed around on the floor trying to catch her own tail. 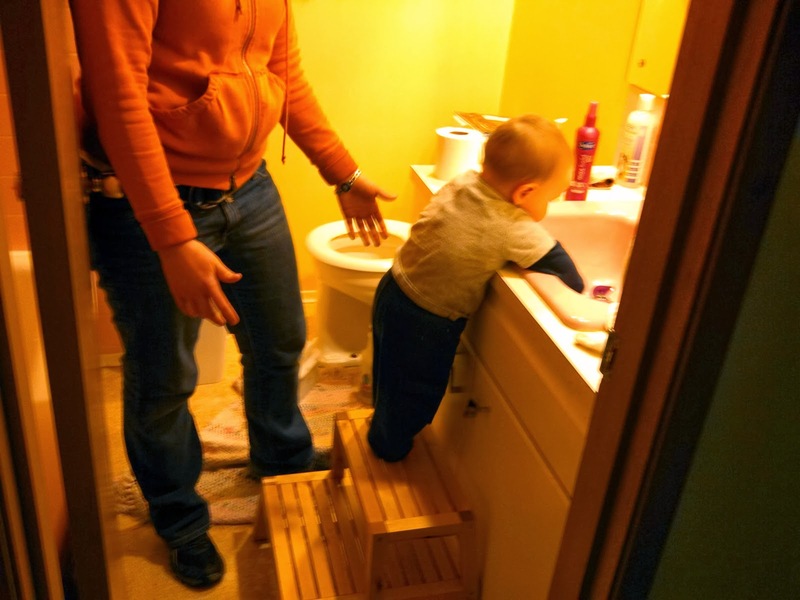 So now he climbs. 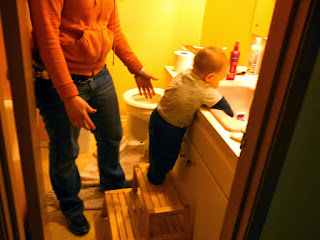 We have to strap him into his high chair, or else he stands up and starts to put his legs over the side. 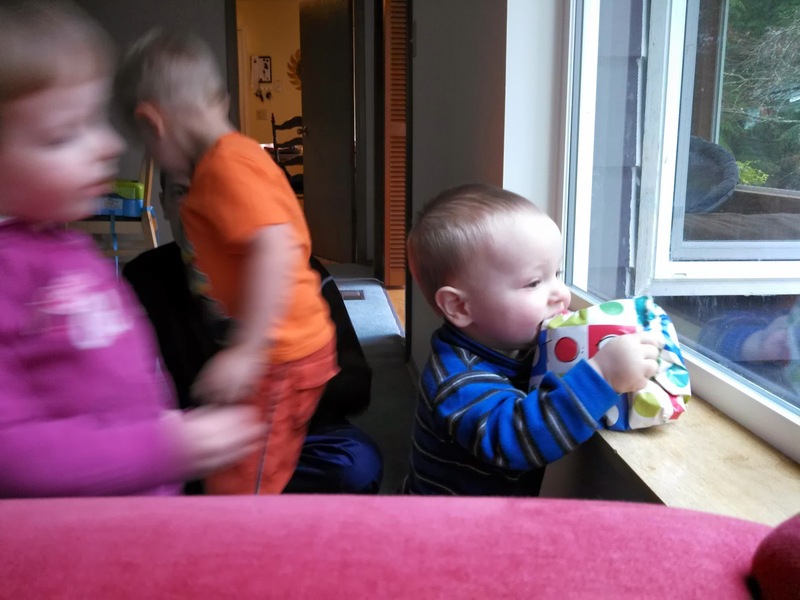 Jared and Eloise climb in and out of their own chairs, so why not B? B can't be left alone at the bottom of the stairs or the top, because stairs reel him in like gravity, which he unfortunately has not discovered yet. He did discover how to clap his hands today. 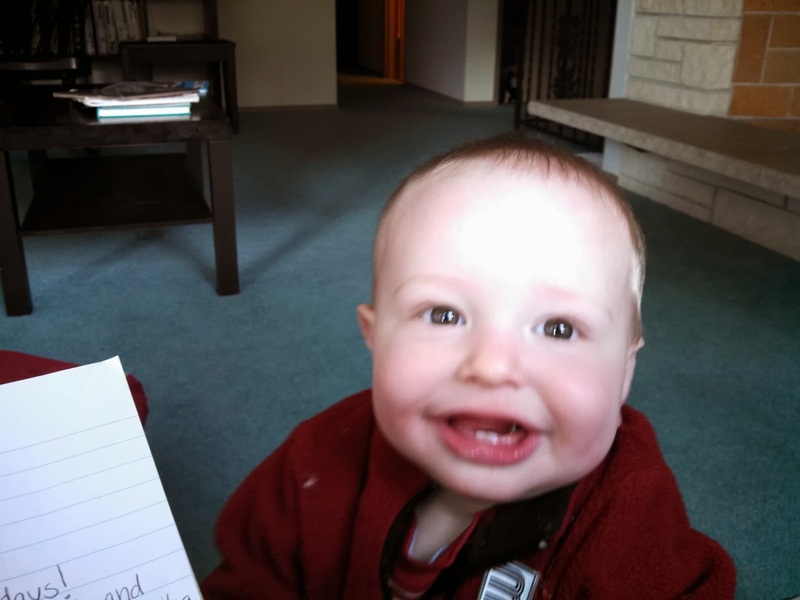 Brace yourselves for some squeezable baby adorableness. You don't have to tell me to enjoy every moment of this. I alternate between exhilaration in these precious moments, and heartbreak that this phase cannot go on forever. It would not be so precious if it were not so fleeting. That's right, folks. Two exclamation points. Count 'em. Two. Todd turned thirty this week. This is a big birthday, and we feel good about nice round numbers that end in zeros, but the actual event ended up being fairly unspectacular. I'm terrible at celebrations, sometimes. 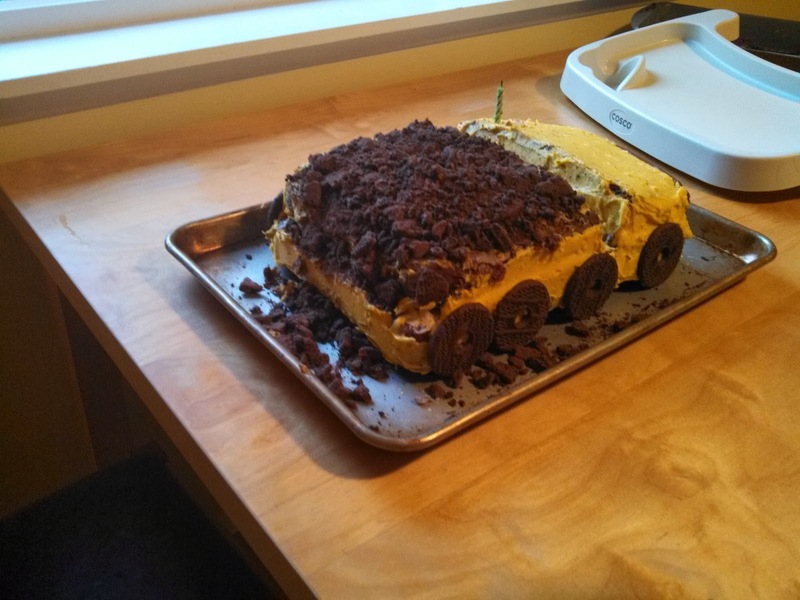 With all of the planning for my mom's visit, and then Halloween, Todd's poor birthday sort of fell through the cracks. Todd requested steak for his birthday dinner, but since I know what he likes better than he does now that we have known each other for eight years, I decided to make him his real favorite food: Thanksgiving dinner. And so I failed at meeting his one request for his birthday, and I didn't even get him a present. The turkey I got was enormous. After I bought it, I wondered if it would fit in our small oven. It did, but there was less than an inch to spare on each side. With a turkey that big, we needed someone to share it with us. 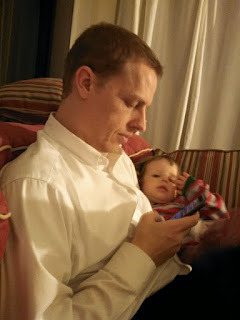 My dad happened to be in town, and we invited some church friends, Evan, Diana, and Vienna. 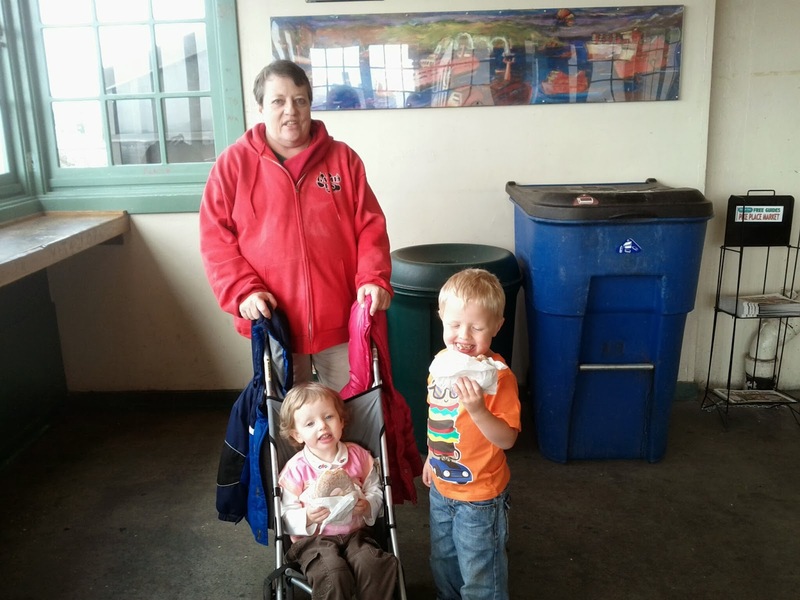 They initially turned down our invitation because they were going to be celebrating Evan's birthday, which is the same day, but we persuaded them to combine parties. It turned out to be really fun. I was organized enough to produce an entire Thanksgiving dinner without anyone else present to watch the kids, so I think I can be excused for forgetting to take pictures of the party. 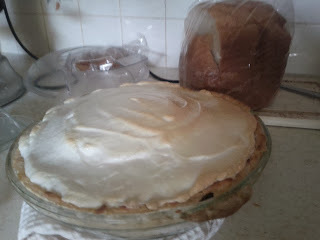 Here is one of the two birthday pies. I made pumpkin (from an actual pumpkin) and lemon meringue (from actual lemons. 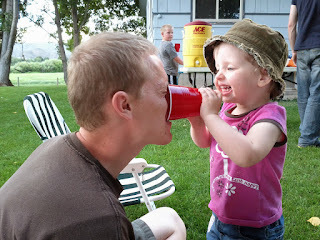 The kids made hilarious faces eating the lemons after I had juiced them.). And here is the birthday boy: much more handsome, sweet, caring, and kind than he was at 22. We are all blessed who have Todd in our lives. Happy birthday, Todd! I am deeply committed to having a better birthday celebration when you turn 40. I will start planning now. I just realized that I never got around to posting pictures of B's cute little teeth. He got the first two at the same time, and he has just stuck with these ever since. 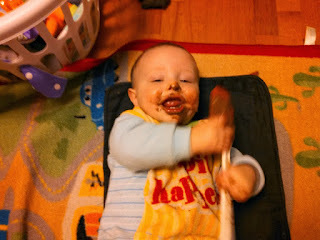 He doesn't see much of a need for additional teeth since he is already a very efficient eater of grown up foods. Here are the teeth in the typical B smile. And here are the teeth in a less typical "Stop flashing that camera in my face!" look. He is very expressive. If you are wondering what happened to his nose, that is pizza sauce. B got Eloise's piece of pizza and used those two teeth to rip a huge bite out of it, and then he used his fingers to break it into smaller, more manageable pieces, massage pizza sauce into the carpet, and smear pizza on every inch of his person. You can see some of the damage on the floor behind him. 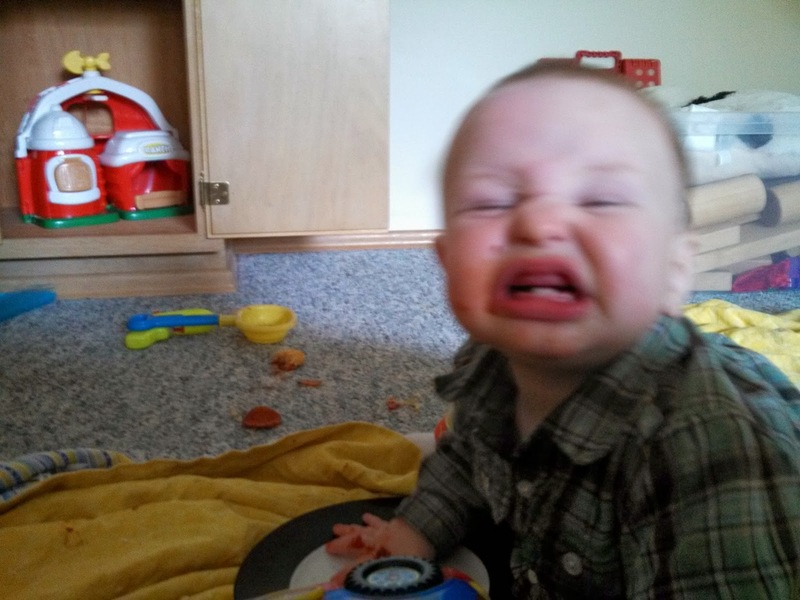 He made this same face the whole time I was wiping him clean. He uses these teeth to devour apples, oranges, and to do serious damage to carrot sticks. Who needs canines, incisors, and molars? Not this guy. Two will do. Our big cherry trees are turning yellow and shedding their leaves. 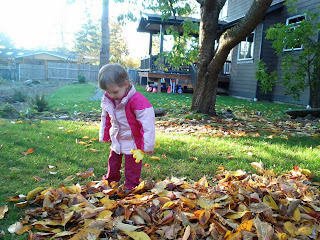 We have had a few dry days, so we decided to go out and rake some leaves. 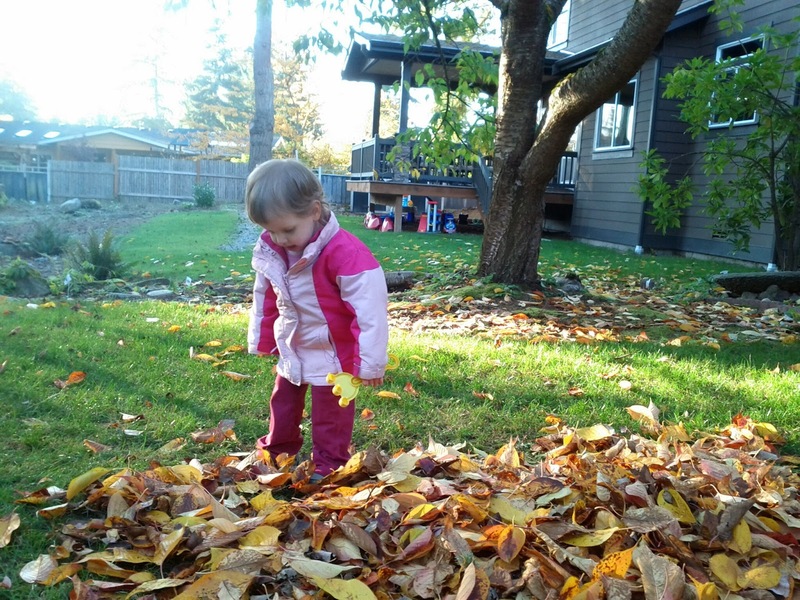 Eloise wasn't sure what all the hype was about with leaf raking. She can't remember playing in leaf piles. She entered the leaf pile with some reservations. 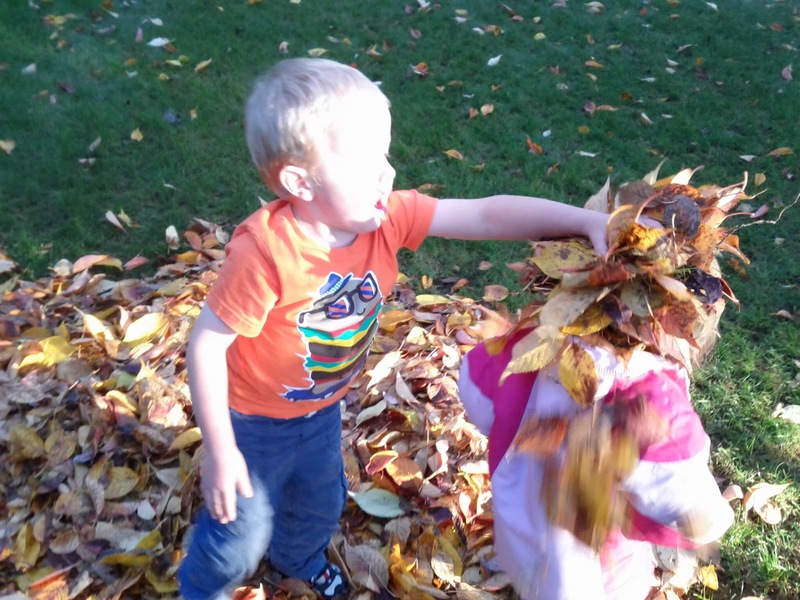 B climbed right through the leaf pile and headed for the dirt where he could lick rocks and make his face all muddy. He knows what he likes. Shadow dove into the leaf pile. She loves a soft pile of leaves (or blankets, or clothes, or towels). The children throwing leaves on her was just a bonus. She loves to be played with. 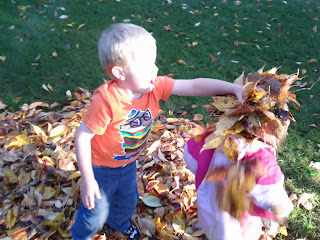 Jared was so busy running around being excited about leaves, picking leaves up from the pile to throw across the yard so that we could rake them again, and howling with glee, that he soon got too hot for his coat. 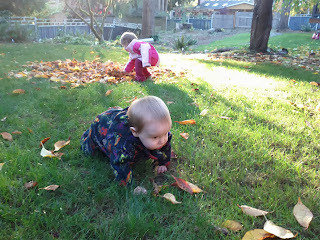 Pretty soon Eloise picked up on the excitement and started giggling and throwing leaves, too. She thought this leaf shower was hilarious. 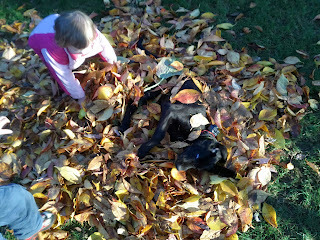 What do you do when there are not enough leaves left to make a pile? Knock more down, of course. 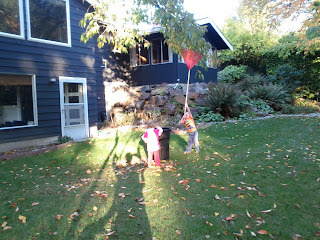 This was not very effective, since the leaves on the lower boughs are still green, but you have to admire the effort. There is nothing like a sunny autumn day for playing in the yard. We live in the most beautiful place on earth. 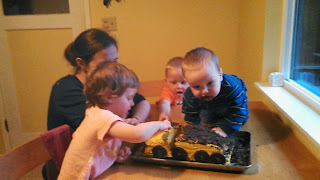 Happy, happy birthday, Grandma Jill! Grandma Jill turned 60 on October 3. I'm sure she is delighted that I am announcing it to the world, but I think she has lived 60 years that she can be really proud of. Every single year of it was hard earned, so 60 is nothing to be ashamed of. 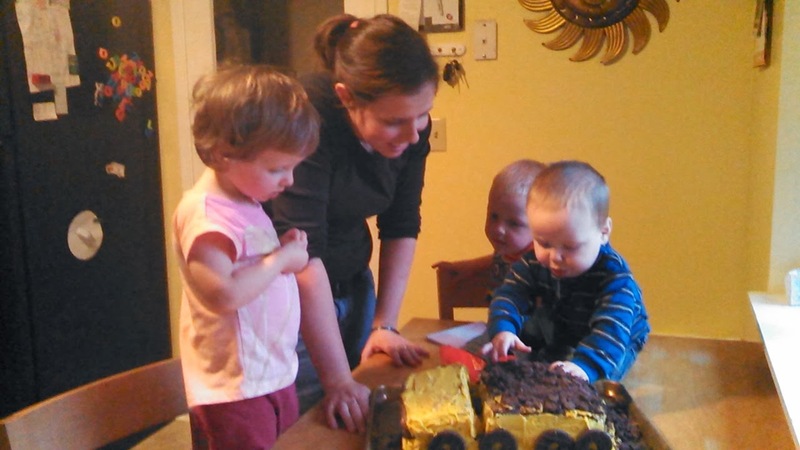 My siblings and I knew that we would have to make her birthday celebration this year spectacular, but we were at a loss as to how to pull that off, since we all live in different states. We started planning a few months ago. I decided that for her birthday, we would have to bring her to Washington to have a celebration with us. On Wednesday, October 16, she flew here. I picked her up late, and we came back and went to bed. 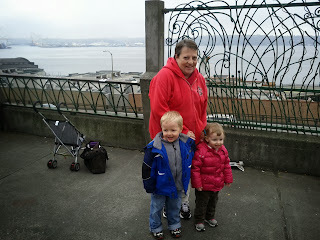 On Thursday morning, we started our whirlwind of Seattle sightseeing and fun. 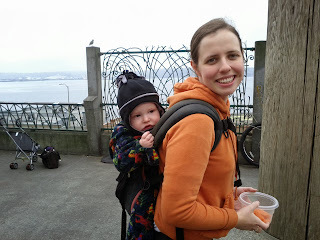 We started with Pike Place Market. 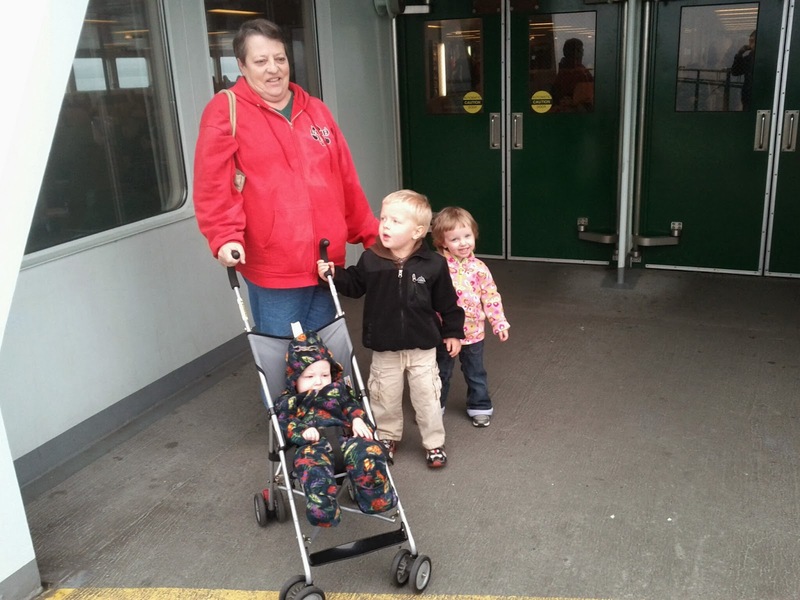 The first time I went to Pike Place, I knew my mom would love it. Jared and Eloise were a little bit hard to keep track of in the throngs, especially since they both insisted on walking much of the time. A wheel fell off of my trusty two seat stroller as I was getting it out of the car in the parking lot, so having both of them ride was not an option. We love the artists and musicians at the market. Jared believed that each musician was performing a personal concert for him. 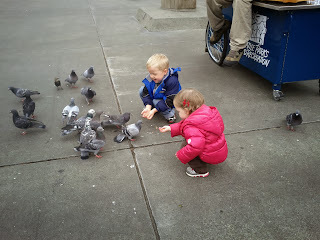 When we came to the end of the market, Jared and Eloise discovered pigeons. I guess where we live is not that urban, since we never see pigeons until we go to Seattle. 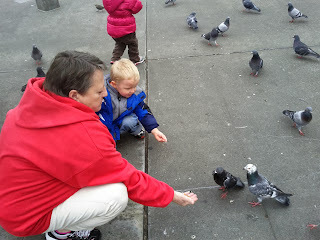 There was a man sitting in the park tossing peanuts to the pigeons, and he let us take a turn. 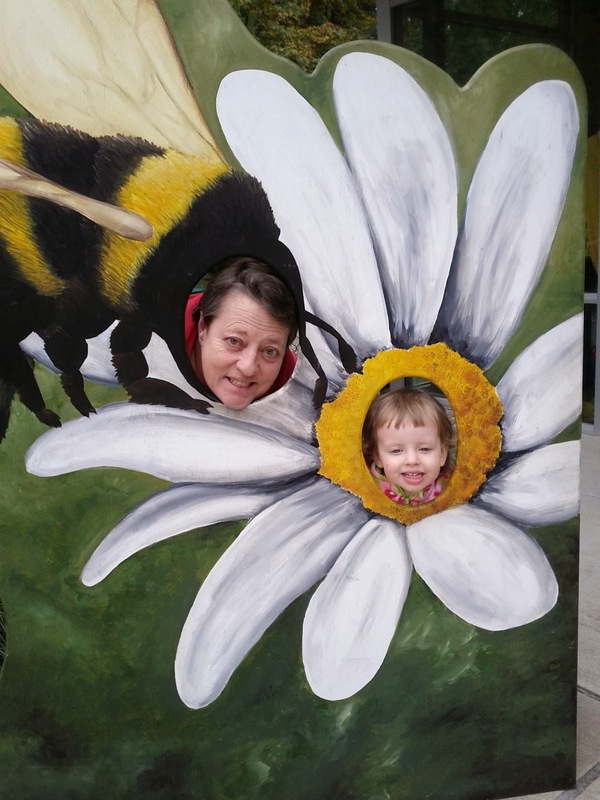 Here is the picture of me and B to prove that we were present. We had a hom bow for lunch from one of the market vendors, and then Jared asked for ice cream. He remembered getting ice cream last year. I remembered the ice cream cones last year being really small and expensive, so I suggested looking for a different treat. Jared noticed a baker's stall as we passed it, and both of the kids picked the least expensive thing in the bakery case of their own volition. 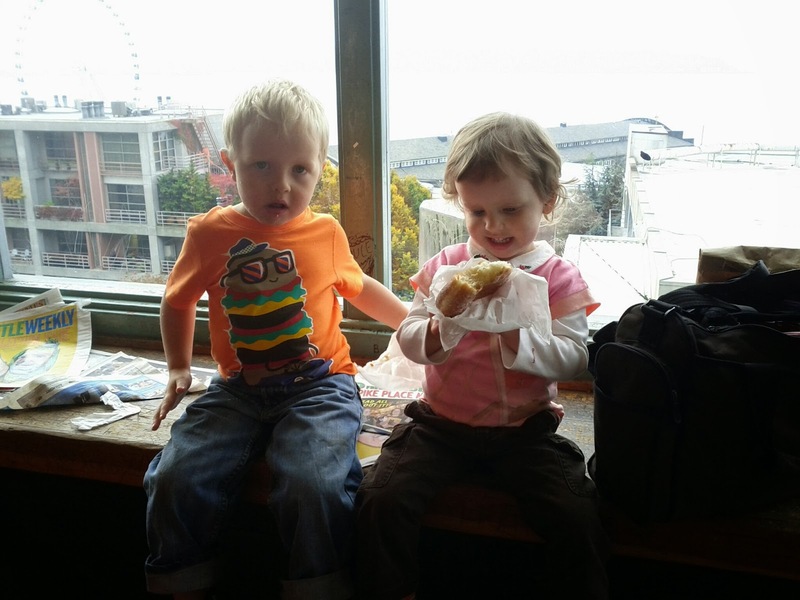 They each ended up with a donut the size of their head for less than the price of one ice cream cone. The giant donut is the one thing that Eloise remembers about this day. At bedtime she asks for a story about something that happened each day. She might want a story about a girl going to a park, or playing with friends. She has requested stories about eating enormous donuts many times. 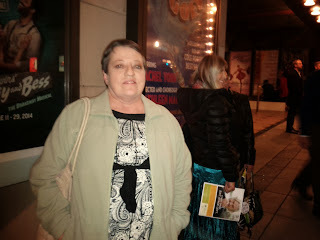 We took the kids home for naps, got cleaned up, ate dinner, and headed back to the city to the 5th Avenue Theater to watch "Anything Goes." It was a really fun evening. On Friday we took the Bainbridge Island Ferry, which is supposed to be one of the most scenic ferries in the Pacific Northwest. We didn't get much scenery. It was a foggy day. 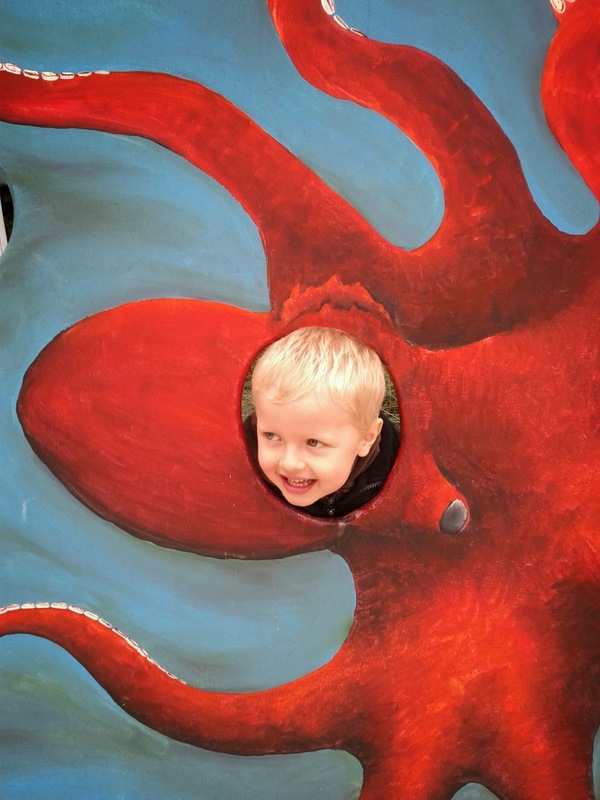 The fun was in the boat ride. 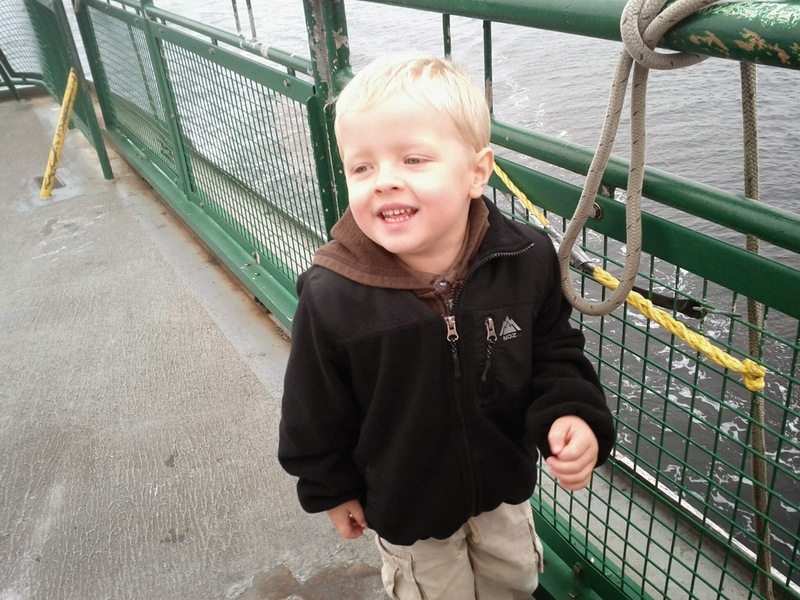 Jared wanted to explore every inch of the ferry. On Bainbridge Island we went to a children's museum. Grandmas are big kids, too, right? 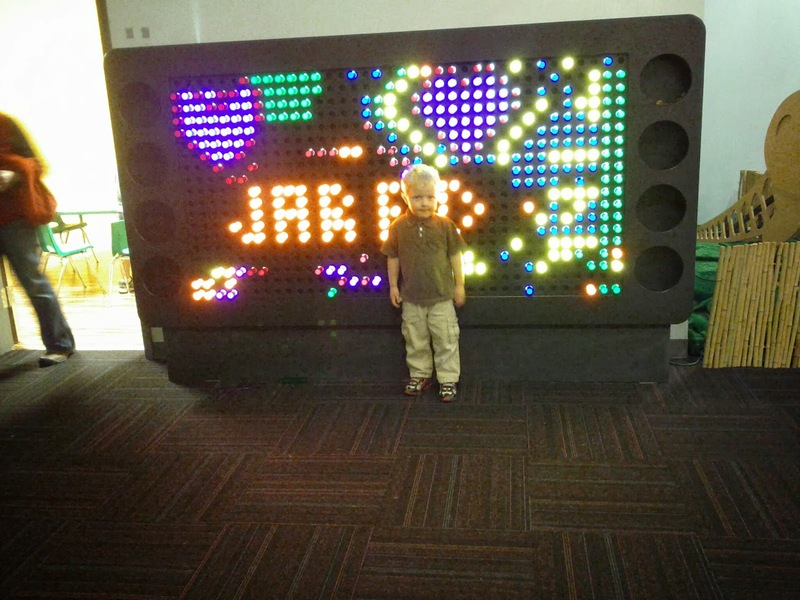 We had lunch, did a craft, made patterns in a giant light bright, read stories, and played a lot. We staggered back onto the ferry exhausted. 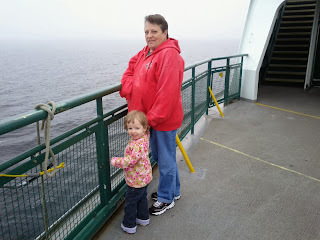 Grandma and B napped for the boat ride while Jared and Eloise explored every inch of the return ferry. When we got home, Grandma helped the kids make sock puppets while I fixed dinner. Grandma said that she had reached her crafting quota for the year with two crafts in one day. 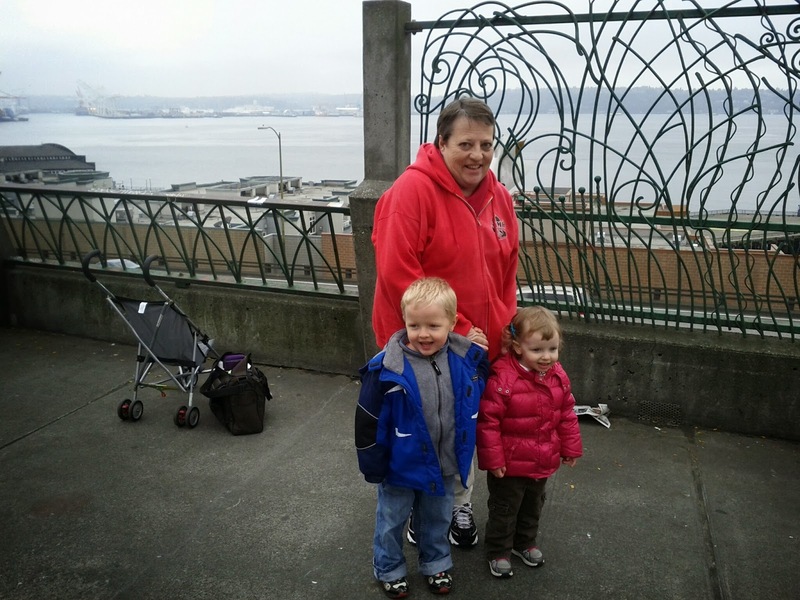 After dinner, B, Grandma, and I drove down to the airport to see Uncle Fred who had a layover in Seattle on his way home from a business trip in Taiwan. We hadn't seen him in over a year and a half, which means he hadn't even met B yet, so it was great to see him, even though our meeting was brief. 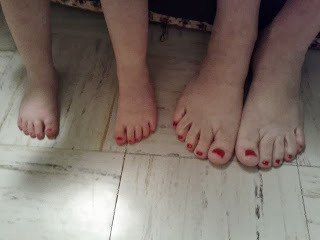 Eloise just got her toenails painted, but she loved getting her toes done with Grandma. She picked her color, and she kept saying, "Look at that pink! Look at that pink!" It was nice to have Grandma with us on Sunday, while Todd and I were both teaching at church. 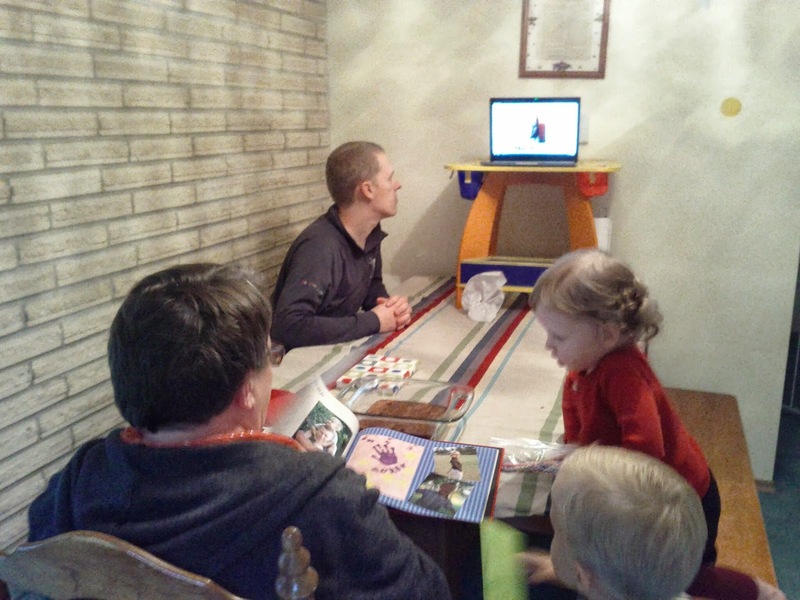 On Sunday afternoon, we broke out the real surprise for Grandma. We got all of my siblings on a hangout, decorated, and had a birthday party with everyone there. 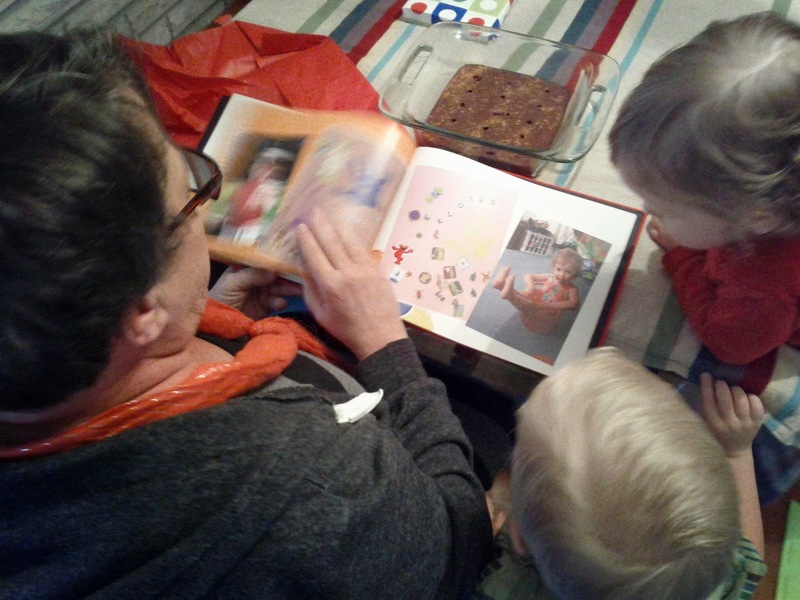 After we sang, Grandma got to open her present: a book that Cheyenne had put together with pictures and messages from all of her posterity. Mama Jill was heading home Monday afternoon, so we had time for one last activity. She picked the locks and fish ladder. 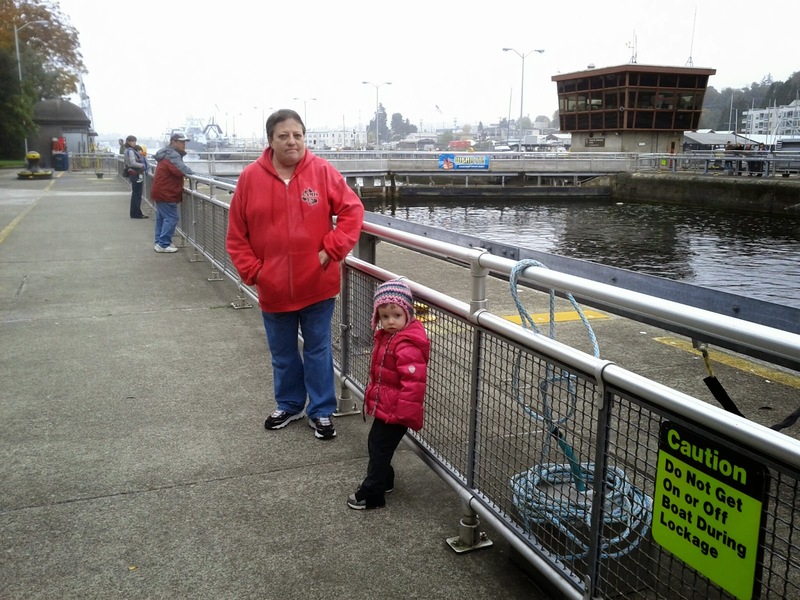 October turns out not to be prime salmon watching season. I saw one fish in our two stops at the fish ladder, and the water was murky enough that I don't know if anyone else saw it. Eloise kept driving Jared in the stroller into the rail as they both screamed with laughter. 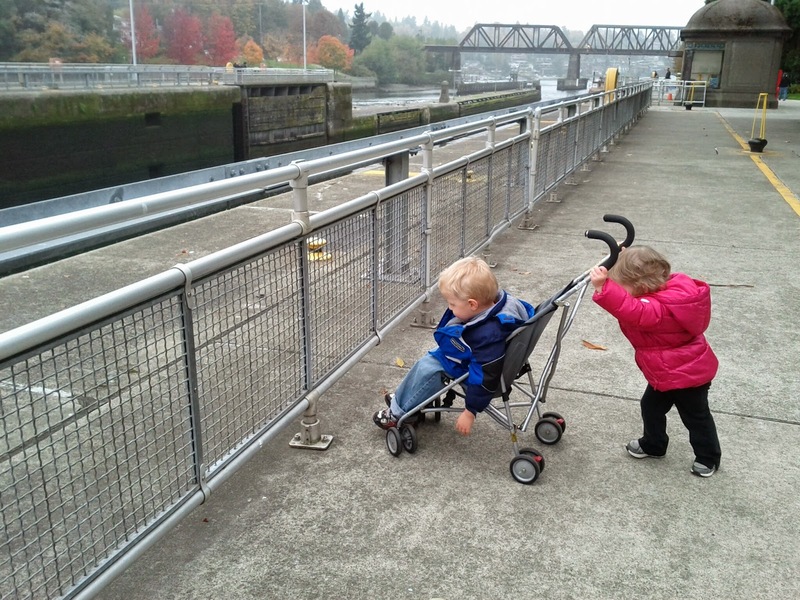 We picked up lunch at our favorite little cafe/ fish store by the locks, which now has plenty of seating, unlike last year. The proprietor must have wanted us to come back. 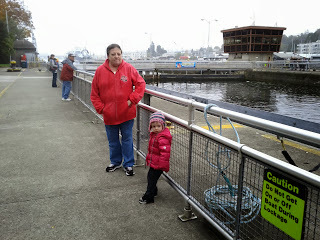 Then we made our way back across the locks and to the car to drive Grandma to the airport. It was a great visit. No one slept quite enough, but we made some wonderful memories. Thanks for coming, Grandma Jill! Happy Birthday!